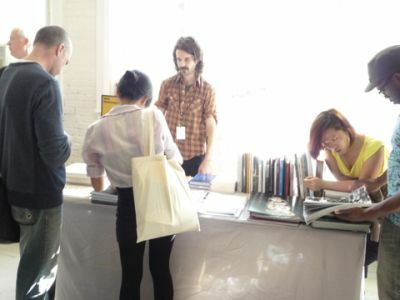 Printed Matter, the world's largest non-profit organization dedicated to publications made by artists, presents the fourth annual NY Art Book Fair, October 2-4 at P.S.1 Contemporary Art Center, Long Island City, Queens. The Fair hosts over 200 international presses, booksellers, antiquarian dealers, and independent artist/publishers presenting a diverse range. Walking with eagerness through the halls of P.S. 1. The books are on the shelves. March up and down their ranks to pass them in review before a friendly audience. Piles of photo books are among them especially on the second floor. There are three stands ready to share with you the mood of anticipation which a photo book arouse in a genuine collector. Dashwood Books, Kodoji Press and Joachim Schmid. Dashwood books is the only independent bookstore in New York City devoted entirely to photography. Kodiji Press is an independent publishing house focused on contemporary art and photography based in Baden, Switzerland. Joachim Schmid is a Berlin-based artist who is publishing his own print-on-demand photo books. Each of them is passionate and think of the photo book as a work of art. One has only to watch them handle the books on their table and how they tell the story about each book; when and where it was published, the edition number, the craftsmanship. Everything remembered becomes part of the narrative that complements these books.